I have had the opportunity to donate my art to six different fund-raisers in the last three months. It was my intention to help them all, but I fell a bit short on my goals and only donated four pieces. It is a good feeling to be able to do the work you love and to have it help others, but it does make it a bit more difficult to have a body of work on hand to exhibit. Years ago, when I first donated a piece of textile art to the local arts center’s annual art auction, I assumed that I would get to take a tax deduction for the retail value of the work I was donating. I knew, from even earlier interactions with this auction, that as a buyer, I could only deduct the amount paid over the retail price of an item. But artists can only deduct the cost of supplies used in the creation of the art. In 1969, Congress repealed legislation that allowed artists, writers and composers to take a fair-market value deduction for their work. Yet, while artists can no longer donate work for market value, collectors who come to own those works can take the full market value deduction if they donate to a nonprofit institution. So, an artist’s donation of work must give its return in the satisfaction of supporting a worthy cause. My children and I had enjoyed many classes and activities at our local non-profit arts center, so I was glad to donate to the annual auction. I felt that this was a way to declare myself an artist, and a way to get my work noticed. However, when I mentioned the auction to another artist, I found that there was quite a bit of unhappiness about this annual event. Well-known local artists felt that the art auction ruined their chances of selling work in the area. They felt that collectors did not acquire art at the galleries that represent them, but instead, waited for the auction to buy, hoping for a bargain price. Agreeing with my enthusiasm about the arts center, they continued to donate their work to the auction, but it was at a sacrifice beyond the cost of that single piece of art. Seeking to address this problem, the solution that our arts center came up with was to offer some additional benefits for donating to their auction. Artists receive a free membership to the arts center, two free tickets to the auction, and a web page supported by the center. Additionally, the artist can choose to take back 25% of the sale price to offset the cost of materials and framing. I don’t know if these benefits have changed the perception of the auction being a local art market destroyer. I do feel that these efforts by the center are in good faith, and probably about all that they can do. In addition, an even more important action taken by the arts center is that they advertise this fundraiser to the entire community. It is not an auction of art by the artists, to the artists. Each year this auction also picks one local artist to be a “Featured Artist” and highlights his or her work on all of the advertisements. This is a way to celebrate the accomplishments of especially talented artists. Somehow this annual award of sorts does not bother me the way that fundraisers with “Invited Artists” does. I have more difficulty getting enthusiastic about donating to an event that loudly advertises work by a selected dozen or so artists, and then is willing to also take my donation to fill in. No doubt, if I were ever a “Selected Artist”, I would feel differently about this! So, are you prepared to make a gift? Auctions are usually an open market. Anything can happen. Sales prices are unpredictable and occasionally painfully low. Make sure you are truly ready to donate your work to the cause. For those who feel ready to take on Congress, supporting legislation to allow artists to take a fair-market value deduction for self-created works given to nonprofit institutions would be a great improvement to the current situation. My wife really gets screwed on donations. She can only donate the cost of the materials involved and not the value of the piece she might sell it for. The person who BUYS the auction piece can turn around and donate the piece and claim full auctioned value on their taxes. Seem unfair? It is. I have always believed that any donation, either of material goods or money, should not be driven by what gain we get out of it in terms of a tax deduction. That being said, I do agree that there is an intrinic unfairness in a system that does not allow an artist the same tax break for donating a work of art as the person who buys it and later donates it. But since those are the rules, any time I DO donate a piece of art, I consider several factors borne out of past experience. I DO NOT put in a lot of time on a piece if the auction historically sees these pieces go for a pittance. (i.e., will opt to machine quilt rather than hand quilt) And I consider the audience when deciding what type of art to donate. But in all cases, I consider that the piece of art represents me, and it needs to be, if not my best work, at least something I would not be embarrassed to see hanging somewhere at a later date. Perhaps the SAQA One Foot Square auction was so successful last year, getting many many donations, because it is relatively painless – almost fun – to work at that smallish size. Ami Simms has received hundreds, if not thousands, of even smaller donations for her Alzheimers charity. They don’t individually sell for much, but it sure adds up. Coincidentally, a friend of mine, Joyce Carrier, just had a donated quilt sell for $2000. It was at a school fund raiser. You can see it on her blog: http://sewartjourney.blogspot.com/ “From Head to Toe”. I absolutely do not respond to requests for donations to groups that I have no connection to. On the other hand, there have been auctions and sales that I have felt honored to have had the opportunity to donate to. When Laura Cater Woods organized the Hurricane Katrina sale of small art pieces I had felt so helpless in the face of that disaster that making a small piece of art to sell felt a bit empowering and filled my own need to do *something*, using the skills that I had. I had similar feelings about Virginia Spiegel’s sale of fiber art postcards to benefit the Cancer Society. June’s point about these kinds of sales of small works is important, as I feel these kinds of sales probably don’t compete with an artist’s other sales as much as donating your usual work. This year Virginia asked me if I would donate a larger piece for her reverse auction and I had two reactions to that request. The first was that this cause (The American Cancer Society) is relevent and important to me. And second, that this event has a certain prestige and respect within the art quilt community, which could only be good for me. And on the subject of which work to donate. It feels less than charitable to pawn off work that has proven to be unsaleable in other venues. I would rather donate nothing. Imagine, too, how embarrassing it is to see your donated work go unsold or sold for a pittance because it was inferior. If I am offering my work to support something I believe in I want it to be my best work. I guess the bottom line is that I think artists are asked way too often for donations, but I think sometimes donating can be an opportunity to either do good or promote yourself positively and those would be the only reasons I would agree to donate work. you too are right — It’s hard to separate the issues from the people who devote loving time and effort to making things work. Those people (Eileen is among them) deserve a lot more thank yous than they probably get from all of us. We often benefit from their efforts, if only because we can sleep easier at night knowing a child has gotten some art materials or a bad tooth taken care of. Or that SAQA will be able to continue to celebrate quilt art through its Journal etc. It’s a terrible conundrum; I think I would be happier to donate to more causes on my secondary list if I saw our basic needs here in the US being taken care of. When hunger and illness and education aren’t being taken care of by governmental agencies and the society as a whole, I’m likely to think of them as the front-line causes. So I resist the worthy but less essential causes that I might otherwise consider. I also think the sheer excitement of a joint cause can make this kind of fund-raising within a group feel more unified. That is aside from need and altruism — it’s often a way to cement relationships among a group. Not a bad thing to happen. Eileen- You are right about donations being a good way to get rid of unsold work. As you say, it doesn’t seem right to advertise your work in a public event using sub-par pieces. But it feels painful to donate your best work! 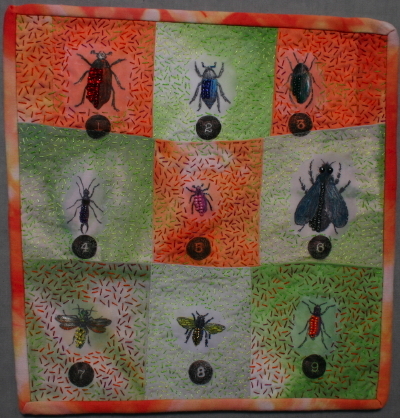 June- I have participated in some of the small scale textile art quilt fund-raisers, and it is gratifying to see how enthusiastic everyone becomes and how much money can be raised. But this is an example of art being sold to the artists, and not to the general public, which is a little sad. I’d like to see these textile art donations put a little more out into the public awareness. Volunteer run fund-raisers do not deserve criticism, though, they do the best they can. The fund raisers of the quilting and quilt art community are an interesting twist. They often involve artists doing a kind of work they wouldn’t normally engage in (I’m thinking of very small pieces) and they seem to be most popular among other quilt artists. I don’t know how this fits into the scheme of things, but I find it interesting as a different set of models. 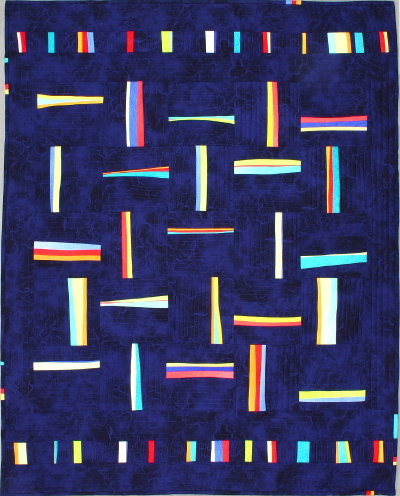 What’s your take on the way quilters and quilt artists donate their work? I’ve donated work to just a few organizations in the past, and am pretty choosy about it. It has to be an organization I strongly believe in. Usually I’d prefer to make a cash donation; my time spent on my art is more valuable to me. Perhaps one thing that would help prevent the underpricing of the auctioned work would be to allow the artist to set the price for a minimum bid. Another problem with some auctions is that they are a place for artists to get rid of those pieces that just won’t sell anywhere else. This may not be good “advertising” for the artist, putting substandard work out there in the public’s eye. Thanks for an interesting and important post, since I suspect all of us are being asked to donate art to one or another causes on a regular basis. Lisa Call once referred various of us to an Association of art metal workers (I can’t remember the precise group and can’t find the reference) who have a very strong stand against donating art without some return. Their guidelines ask for the artist to receive a percentage of the auction price, which helps to keep the prices up for art in general as well as rewarding the artist. At a local elementary school, I’ve been asked to donate art, but here the students choose an artwork from the donations that they would like to emulate; they get an exhibit of their finished work later in the month and they get to keep the art. This is one that I like participating in; I don’t feel as if I’ve knocked down the price of art for my fellow artists and I do feel as if I might be an inspiration to a budding artist. I also donate art to causes which I feel are especially important — in one case it’s the health clinic for migrant workers that gets my help. I’ve also donated auction works for a local food kitchen, but found that I can be of more use by giving them money directly. I don’t donate to art organizations unless they follow something like you’ve outlined, a way to reward the artists who may to some extent be undercutting themselves when they donate in that way. I also have donated to schools where I had a vested interest, like the ones my granddaughter has gone to. There, I figured doing good for the school was doing good for me and so I was happy to overcome my skepticism. Like you I think hard about donating art works and am leery of the way we are casually asked for our life’s blood. I also think that art organizations like SAQA and SDA ought, as a matter of course, have strong rewards built in for artists who donate their art.